“Untitled (Human Mask),” (2014). Film. 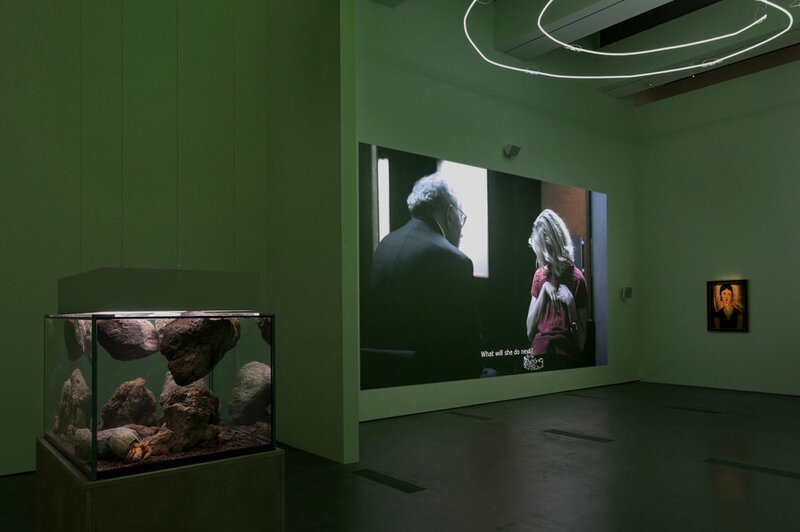 Exhibition view of Pierre Huyghe at the Los Angeles County Museum of Art. Courtesy Los Angeles County Museum of Art. © Pierre Huyghe. Photo: © Museum Associates/ LACMA. “Untitled (Human Mask),” (2014). Film. Dimensions vary. Courtesy Marian Goodman, New York; Hauser & Wirth, London; Esther Schipper, Berlin; and Anna Lena Films, Paris. © Pierre Huyghe. “Why is there a dog here,” a woman asks swiftly, interrogating her companion in the entryway of the Resnick Pavilion. She says this so flatly, so disinterested in the answer before he has a chance to provide it, that she strips away the wonder of the moment: seeing this animal, all bones and skin with one pink foreleg, standing sleepily in this gallery lobby, greeting Saturday morning art tourists. During my drive over in the rain, a rarity for this drought-punctured city, the gloom found its way in through my radio: a French commentator mistranslated the idiom “lone wolf” while describing the perpetrators of the most recent terrorist attack in France, charmingly characterizing the group as a “lonely wolf,” eliciting a bitter chuckle as I pulled into the parking garage. In an effort of good will, I forgive this woman for the sharpness I perceived. The dog is named of course, Human, an Ibizan hound that serves as a living element and placidly disinterested master of ceremony for Pierre Huyghe’s LACMA retrospective that runs through the end of February—one of three independently curated mid-career retrospectives for the artist. 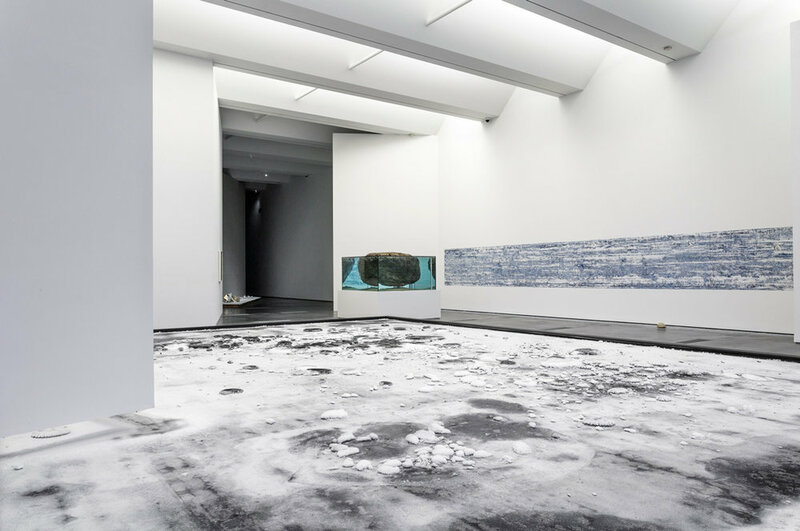 The two others exhibited at the Centre Pompidou in Paris (September 26, 2013 – January 6, 2014) and at the Museum Ludwig in Cologne (April 11 – July 13, 2014). At the entrance of the exhibit your name is requested by a “name announcer” (also the title of the performance) so that you may be formally introduced to the space. It’s a detail that, despite the pomp and circumstance, is injected with warmth by the staff. After providing my nom de plume the announcer repeats it back to me before shouting it around some unknown corner, careful that my introduction to the exhibit is delivered with correct pronunciation. I’ve occupied this space before, but today there’s a destination. I find myself quickly navigating the labyrinth of the exhibit, passing shoes atop a scuffed pedestal—shorthand for the 1996 performance “Singing in the Rain”—and a series of Polaroids from 1993. I enter the spatial heart of the exhibit in time to catch a showing of “Untitled (Human Mask),” a 19-minute film in the midst of its U.S. premiere at this Los Angeles County art museum. “Human Mask” opens with a drone exploring the ruins of Fukushima, before giving way to focus on a single figure. My first viewing (admittedly brief, and with a dispassionate laziness) imagined the living element in the film to be a human wearing a latex mask and a dress, barreling through a restaurant. But the figure in this film is a monkey, one that typically works as a waitress, serving sake and handing out hot towels to diners at a restaurant near Fukushima. In “Human Mask,” the imp occupies a similar space, a restaurant, but the rules are different: her style of dress has been altered to suit Huyghe’s aesthetic, and the restaurant—where her typical duties involve serving others—is empty. The frustration is evident in her movements, betraying the smooth façade of the blank mask. One can sense boredom and confusion as she circles familiar appliances, hovers near the fridge, neatly seats herself by the tables, as if being good will be enough to implore the others to return. This gives way to agitation: banging around the kitchen, knocking over a glass—a cut shot hints at her removing the mask. We see a roach scuttle across the tile floor. And then she appears to whimper, there’s a sense of giving up, of quiet contemplation and acceptance—or resignation. The film ends. And then Gregory came back to the curation and the work’s relationship to its current home: “Human Mask” didn’t show at the retrospectives in Paris or Berlin, and in this film she also sees Los Angeles. “[The artist] is also very interested in the idea of performance and the actor and this sense of; what is an actor if they don’t have a role to play? Are they just an empty vessel just waiting for a part? That phenomenon—especially coming to Los Angeles—is about what it means to be an actor without a part—and that’s essentially what she is.” It’s a reversal of my initial read of the video, one that imagined a human actor in this role, the movements deliberate. I think about telling the sisters that the light tiles on the ceiling are actually a video game, that those boxes on the ground are joysticks, and that, yes, they can touch the art. Then I see a museum guard approach The Woman and her Companion, imploring them to give it a go, explaining how it all works. In an environment in which we’re used to seeing a strained relationship, at best, between guards and museumgoers—”don’t touch this”; “no photos”—this moment feels tender. The Woman laughs as she realizes they’re playing something familiar—Atari. Absent the soundtrack of the film, the room falls into a meditative silence. The guard looks on and a crowd gathers. You can now hear the abrupt, unsettling atmospheric pitches from the 2010 film “The Host and the Cloud,” one room over, and the man at the entrance announcing the arrival of another guest, but there’s something else: There’s purpose here. Community has replaced the “Human Mask,” and we’re freed from the primate’s imbued loneliness. Elsewhere in the exhibit, a man approaches Human’s handler, asking him about a book he is reading. I notice for the first time that Human’s human has a scar on his head near the left temple, the shape of it not quite a closed circle. Human sleeps on a fur nearby, the deep slumber of a dog secure in the notion that his pack will not leave him. Near the combined entrance and exit I pause at a video of two boxers, these opposing forces leaning into each other, struggling. A woman nears the name announcer, as is procedure. She lets out a bright, infectious laugh as FLORENCE WELCH is bellowed into the abyss: to no one in particular and with no singular purpose. But here, as I stand in this void, I find a respite alongside the violence: wonder, and in that, joy. May it remain so.